Some months ago, the receptionist in my clinic handed me a registered letter. The name of the sender seemed familiar. “Dear Sir,” the letter read. “Please be advised that this letter serves as official notice that I am considering a potential claim against you in a medical Malpractice claim in regard to my husband. . . .” I stood, stunned. My white coat, which held the daily tools of my profession — my list of patients, the Sanford antibiotic manual, a black stethoscope — felt extraordinarily heavy. While my receptionist and staff made themselves busy and waited for my reaction, I struggled to recall the patient, so many patients ago . . . and my alleged misdeed. I checked the administrative data, which showed that the man had died about a year before. Had I missed a lab test among the hundreds that I order each week? Had I failed to read a blood culture report? Had some error of mine resulted in his death? I generally think of myself as a confident and conscientious practitioner, but my pulse was racing and my palms were moist as I reviewed the patient’s hospital chart that afternoon. He had been a man in his late 60s with a bacterial infection in his lungs. I checked the reports on all the cultures I had ordered: blood, urine, sputum. Then I checked the antibiotics I had prescribed. There was no mismatch; he had been on appropriate treatment. I asked another doctor to double-check me. Had I been negligent? No. I was relieved — but still accused. 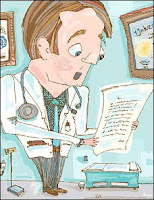 More important, the letter made me reflect on the paradoxes of our medical malpractice system. Most malpractice suits turn out to be against doctors who were not at fault. Of every 100 malpractice claims filed, only 17 appeared to involve a negligent injury, such as a medication overdose resulting in death, according to a 2004 New England Journal of Medicine review. This means that patients and lawyers appear to be suing the doctors and hospitals for non-negligent injury 83 percent of the time. Some researchers have likened our malpractice system to a traffic cop who gives out 100 tickets to nab 17 drivers who have run a red light, in the process ticketing 83 who drove through a green light quite properly. The second paradox is this: Studies of hospital records show that of every 100 injuries that occur due to medical negligence, only two result in malpractice claims. This means that 98 of 100 negligent injuries go unchallenged. To continue with the traffic analogy, of all the drivers who run red lights, only a very few are caught and receive a ticket. I contacted my malpractice insurance company. No doctor can afford not to have one. For the security of having an insurer willing to pay up to $3 million per incident, I pay $7,000 a year in premiums. I’m relatively lucky: A cardio-thoracic surgeon colleague pays nearly $100,000 a year. The attorney who answered my call asked me, in a calming voice, to fax the letter and the medical records to her. The next day, I was considering whether to order a CT scan for a hospital patient experiencing abdominal pain. On the one hand, I did not think the scan would reveal anything significant, and I try to avoid ordering unnecessary tests. But then I thought about a potential lawsuit. What if I missed a cancer or an abscess by not ordering a CT? How would I defend myself? It was easy enough to pen “CT abdomen to rule out abscess” — something that could be identified and treated if found through this extra test. The fear of a lawsuit trumped all other thinking: I ordered the scan; it was negative. A lawsuit threatens my livelihood. It alters my judgment; it’s like the difference between the “right thing to do” and the “politically right thing to do.” Surveys of physicians conducted by the Massachusetts Medical Society found that 80 percent practice “defensive medicine,” ordering extra tests that some say add billions annually to our health-care expenditure. Nonetheless, I do believe that our malpractice system serves a necessary purpose. I recall a conversation I had with a nurse I have known for a decade. In her office she had me leaf through the photocopied medical records of her late husband and asked for my advice. He had been hospitalized because of his addiction to pain pills and then, late one night in the hospital, he had been given exceedingly high doses of sedatives without proper monitoring. He suffered a respiratory arrest and died. The doctor and the hospital staff failed to explain to her what had happened. With tears in her eyes, she asked me what she should do. “Sue them,” I said softly. The malpractice system is a stick that reminds wayward doctors and hospitals that health care is about patients. It helps keep the arrogance, negligence, mismanagement and greed of some doctors and hospitals in check. It holds health providers to a basic standard of care. It gives the ultimate hand, in how care should be delivered, to patients. So how can we improve the malpractice system? There is no easy solution. The health-care overhaul bill was a missed opportunity. Legislation could have devised a “safe harbor” standard ensuring that a doctor who follows guidelines won’t be sued if a patient is injured. Also, special medical courts could have been created to determine negligence and compensation. The new law encourages states to explore these kinds of remedies, but this is unlikely to happen. As for that letter that I received, my medical partner, a humble and thoughtful man, suggested that I write back to the widow. “Often, patients and families just want their doctor to reach out to them,” he reminded me. The evidence shows that the best way to prevent a malpractice suit is to have good doctor-patient communication. I didn’t receive a call or a request to visit my clinic. But I was not served papers for a lawsuit, either.